Rachel, Kyle, Jeff and Bryan hang out and shoot the shobijin in another Yak Attack episode! 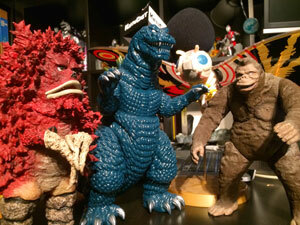 Hey there, welcome to the Kaijucast HQ! What? Oh, nothing – we’re all just hanging out and having a few beers and talking about whatever the hell we want… MONSTERS… and life …and stuff and things. It’s all very conversational, I assure you. Some of the nonsense about to bombard your ears: Jeff and I had just gotten back from camping. Ideas for Camp Kaiju. and Kaiju Camp. Don’t kill Bryan Cranston. Toho’s Godzilla speculation based on Attack On Titan’s trailer. Pacific Rim’s Maelstrom and beyond. The Unboxing Episode. Reaction Videos vs. Japanese Picture-In-Picture. Multnomah Falls. Top Gunnery. Movie Bears and Moebius. Kyle’s Famous Monsters debut. Ultramanga! Ready Player One. Ultraman X. Rose City Comic Con awesomeness! Halloween stuff arrives. Keep your eyes peeled for the Daikaiju Discussion coming in just a few days! …and if you are going to RCCC15 and want to be one of the contestants, please fill out this form right now!